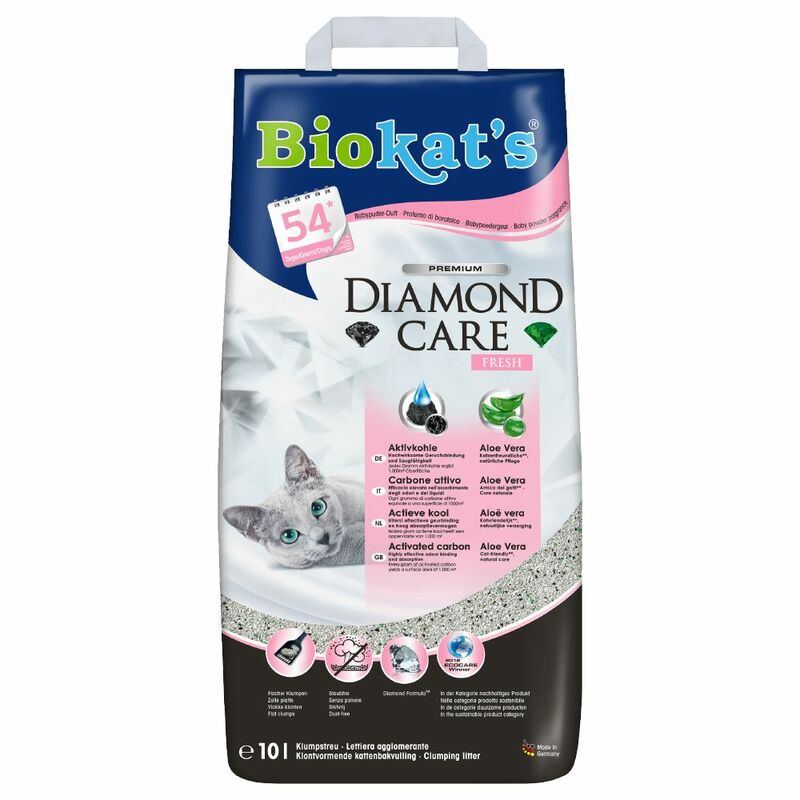 Biokat's Diamond Care Fresh cat litter is a clumping cat litter made from natural clay that uses activated carbon and natural fibres for highly effective odour binding. The natural raw materials come from coconut shells, which are a renewable source of natural fibres. Activated carbon is a highly porous carbon compound with a huge inner surface area: one gram of activated carbon would measure around 1,000 sq/m if unfolded. This, in combination with physical forces, keeps odours effectively locked up. The cat litter has been enhanced with a pleasant baby-powder aroma. Aloe vera has also been added, to care for your cat's sensitive skin. The ripe aloe vera leaves are sent to the manufacturer as soon as they are harvested, and are then washed and peeled by hand. Once this is done, they are made into aloe vera gel, aloe vera eΒence and powder concentrate. Aloe vera eΒence is sprayed on the litter to provide extra-special care for your cat's sensitive paws. The fine grains of cat litter are low-dust and form flat clumps when they come into contact with moisture, in which odours and urine are locked away. Biokat's Diamond Care Fresh only uses 100% natural clay with a reliable absorbency. As with all Biokat products, this litter is made in Germany. Biokat's Diamond Care Fresh at a glance: Clumping cat litter with effective odour binding Made in Germany With Active Carbon: Highly porous carbon compound with a huge inner surface area, where 1 gram represents around 1,000sq/m, for excellent odour binding With Aloe Vera: Sprayed onto the litter in the form of liquid eΒence, to provide pleasant and lasting care for your cat's paws With the aroma of baby powder Forms flat clumps Very fine granules. Low dust production Made from 100% natural clay Can be used for up to 54 days Manufactured using only premium natural raw materials Clay sourced solely from approved open-cast mines.